We align with Australian farms who value safety and sustainability. We source our protein products from Australian farms that are aligned with our company values of safe and sustainable production of food. We provide a direct connection between our customers and farmers using world leading practices to ensure our customers know where their food products come from and can be confident in the healthiness of our products. This is achieved by ensuring the traceability to guarantee where the products come from and sourcing products, where possible, from producers with world leading sustainability accreditation systems to ensure the highest quality of product. 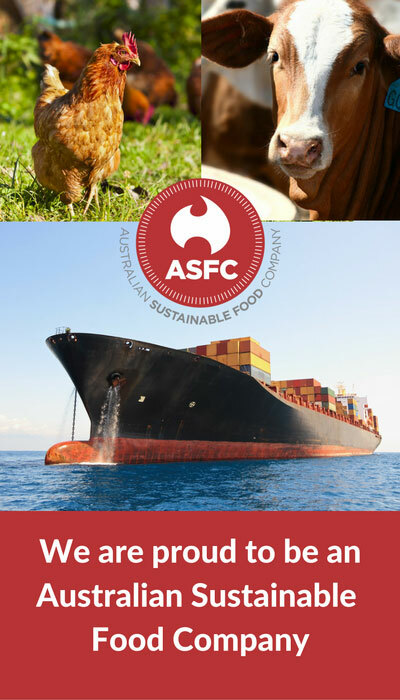 Provides a secure, consistent and reliable source of high quality Australian beef, seafood, poultry and other products – direct from Australia. Offers competitively priced Australian beef and protein products.